All journalists want to write a story that makes a big splash. John T. Elson, the religion editor at Time magazine, was no exception. But in 1966 he got more than he bargained for. For more than a year, Mr. Elson had labored over an article examining radical new approaches to thinking about God that were gaining currency in seminaries and universities and spilling over to the public at large. The issue caused an uproar, equaled only by John Lennon’s offhand remark, published in a magazine for teenagers a few months later, that the Beatles were more popular than Jesus. 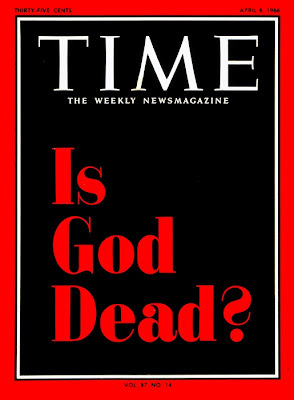 The “Is God Dead?” issue gave Time its biggest newsstand sales in more than 20 years and elicited 3,500 letters to the editor, the most in its history to that point. It remains a signpost of the 1960s, testimony to the wrenching social changes transforming the United States. For the next six pages, readers were guided through thickets of theological controversy and a shifting religious landscape. Profound changes taking place in the relationship of believers to their faith were often expressed through the words of people, both eminent and ordinary, grappling with the same fundamental problems. Simone de Beauvoir, Claude Lévi-Strauss, Billy Graham and William Sloane Coffin were quoted. So were a Tel Aviv streetwalker, a Dutch charwoman and a Hollywood screenwriter. More than 30 Time foreign correspondents were also involved in the project, conducting some 300 interviews to measure contemporary thinking about God around the world. “Secularization, science, urbanization — all have made it comparatively easy for the modern man to ask where God is and hard for the man of faith to give a convincing answer, even to himself,” Mr. Elson wrote. John Truscott Elson was born on April 29, 1931, in Vancouver, British Columbia. His father, Robert T. Elson, was a newspaper reporter in Canada who later became a high-ranking editor at Time and Life and helped write two volumes of the three-volume “Time, Inc.,” the company’s official history. He died in 1987. John Elson was educated at St. Anselm’s Priory School in Washington. He received a bachelor’s degree from Notre Dame in 1953 and a master’s degree in English from Columbia in 1954. That year, he married Rosemary Knorr. She said her husband died at home in Manhattan after being in poor health for the last two years. Mr. Elson is also survived by two children, Hilary Elson Alter of Lake Zurich, Ill., and Amanda Elson of Wyomissing, Pa.; two sisters, Elizabeth Elson of Manhattan and Brigid Elson of Toronto; a brother, R. Anthony Elson of Chevy Chase, Md. ; and a grandchild. After serving with the Air Force in Japan, Mr. Elson worked for the Canadian Press news agency before being recruited by Time and assigned to its Detroit bureau. As an editor, he started out on the lowest rung, in the milestones and miscellany departments, and rose to assistant managing editor. Along the way, he edited every section in the magazine except business. He retired in 1987 but continued to write for the magazine until 1993. It was as religion editor that Mr. Elson made his most lasting mark. He wrote numerous cover stories on religious issues — “Is God Dead?” was the 10th — and committed the magazine to serious coverage of ideas and arguments normally encountered in more specialized journals. Unquestionably, Mr. Elson touched a nerve. Clergymen took up the challenge thrown down by the “Is God Dead?” cover line in Sunday sermons. Church publications and newspaper editorials chimed in. “Your ugly cover is a blasphemous outrage and, appearing as it does, during Passover and Easter week, an affront to every believing Jew and Christian,” one reader wrote. Others wrote to explain their faith in fervent terms. Atheists gloated or scoffed.